Giving gifts can be such a fun way to express your love or appreciation of someone. It shows the thought and care put into selecting a present for your loved one. However, chocolate, flowers, and teddy bears aren't for everyone. 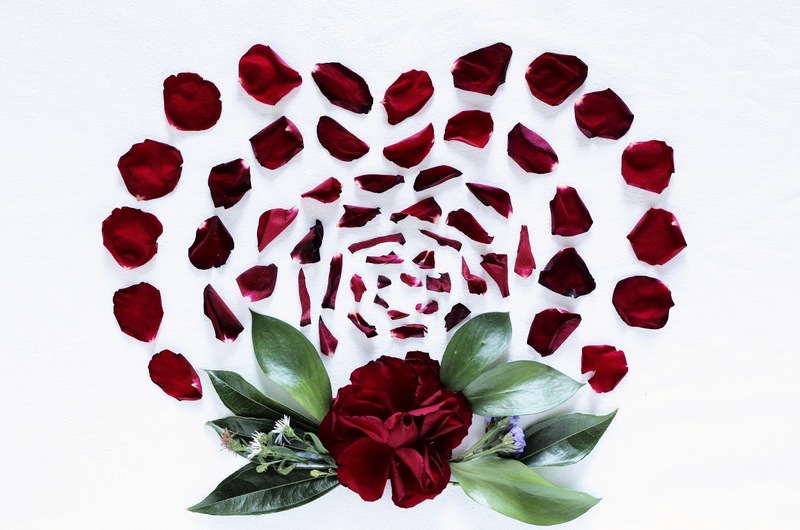 I've put together a list of 27 unique Valentine's Day gifts that aren't completely heart themed, but still make great presents for that special day. PS: While I love the idea of Valentine's Day ( for me it represents celebrating your love / affection with someone special-romantically or platonically ) I don't think it's necessary to buy someone a gift to show love. It is a very special gesture that shouldn't have a lot of pressure or doesn't have to be expensive. So despite this being a guide of fun gift ideas, if giving a homemade card and a home cooked meal is how you choose to express your love, I think that's beautiful and no one should make you feel like you need to do anything else if that works for your relationship! 1. Gold-Dipped Serving Bowls // OH so pretty!!! It comes in white + gold and blue + gold. I imagine myself being so excited to host- serving with this. Definitely on my personal wish list. 2. Gilded Greetings Cheese Board // How cute is this!?! I love all things Anthropologie and when I saw this it just screamed Valentines Day to me...or rather it said, "Hello Lovely" to me. 3. Ceramic Bells // I been coveting Emily Henderson's ceramic bells from artist MQuan for years and when I recently went to Jenni Kayne's Palo Alto store (whom I love and whose store is to dye for) I was over the moon to find she is now carrying MQuan's work. Now I just have to decide which pattern and styles I want to get...so hard to choose! 4. Round Pintuck Pillow // Such a great find for the vintage inspired gal in your life. 5. 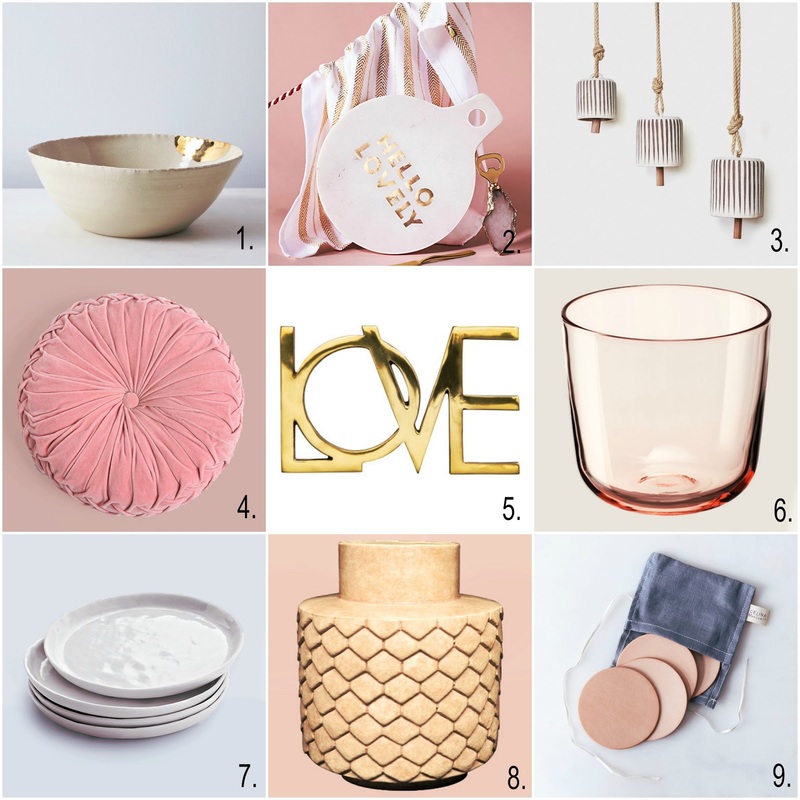 Love Trivet // Nothing says Valentines more than "Love" literally spelled out in gold. I like that this is not just another tchotchke to take up space but is a practical, working gift. Plus it's on sale right now! 6. Blush Pink Glasses // You can't get more affordable than Ikea and this blush glassware is sleek and stylish enough to go from everyday use to cocktails. 7. Dinner Plates // I've been searching high and low for the right new dishware that is modern, sleek, yet has a somewhat rustic stoneware style...all while not being CRAZY expensive. Viola! These seem to be perfect AND they're dishwasher safe. 8. Blush Vase // It's on sale right now and looks very chic. Sometimes Target hits it out of the park with home decor that is so stylish and looks high end while still being very affordable. This is great for styling flowers of all kinds as well as just using is as sculptural art on your bookshelves or credenza. 9. Leather Coasters // I like these for their simplicity, elegance, and durability. 1. Copper Coffee Collection // He'll drink his coffee in style (and hopefully share with you). 3. Domino Set // I love to play boardgames with my boyfriend and adore how this domino set is so easy on the eyes: best of both worlds. 4. Carry-On Cocktail Kit // This is a great gift anytime, but especially if you're going on a romantic getaway for Valentine's weekend. Pack this to enjoy on your flight or make your own artisanal cocktail rather than raiding the mediocre mini-bar once you arrive. 5. Jack Black Set // It's a simple facial skincare set that smells and looks masculine. I'd throw in some beard oil if you're significant other likes to keep well groomed facial hair. 6. Puma's Roma OG 80’s Sneakers // Classic, original, and perfect: just like him (O.K., I know that's incredibly cheesy but it was the honestly the first thing that came to mind when I was figuring out how to describe these and I mean, it works...because it's stinkin' true!). 7. Match Bottle // This is a simple gift I'd include with a package of things, such as a "Home Gift Basket." The waterproof strike-on-bottle design makes it great for the kitchen and bathroom or even camping (which makes it a little more masculine). 8. Ray-Ban Wayfarer Sunglasses // These are really classic and durable while mysteriously somehow looking good on almost everyone. 9. 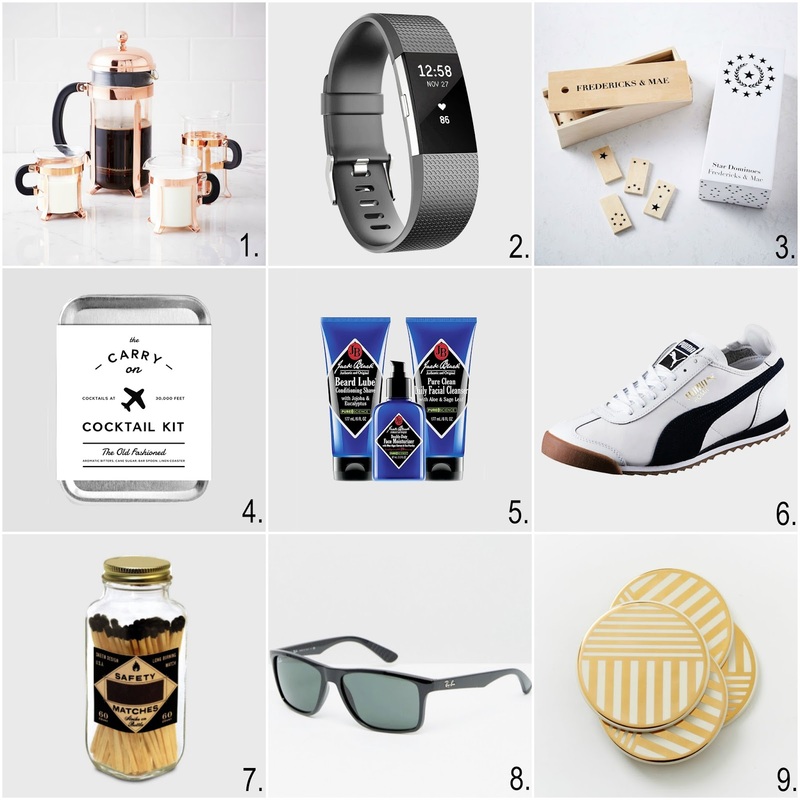 Gold Coasters // I love the clean lines and Art Deco inspired gold design. Great addition for the guy that loves Mad Men and whiskey on the rocks. 1. Butter London Nail Polish // I love this brand of polish. It doesn't yellow your nails and holds up well. 2. Silk PJ Set // Soft satin silk pajamas are a nice alternative to buying her lingerie. Printed with blush hearts, this comfortable duo is perfect for Valentine's Day. 3. For Like Ever Print // This cheeky print is a Domino exclusive by artist Tracy Jenkins. She says, "In a way it was meant to be a love letter to each other and a celebration of the exciting and scary prospect of a new beginning." 4. 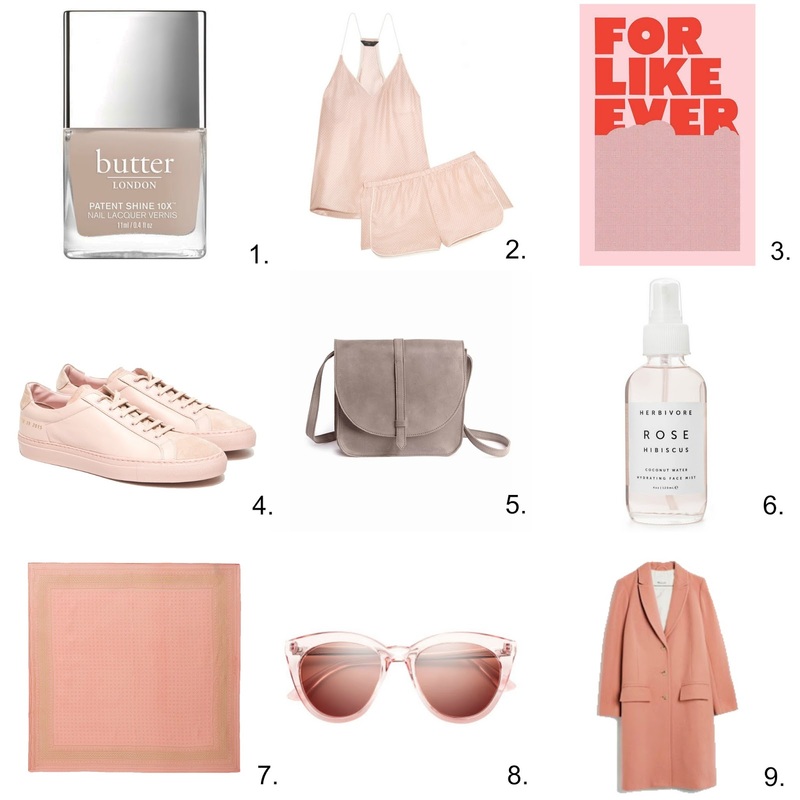 Blush Sneakers // I adore blush and white leather sneakers and how they are both stylish and comfortable-practical enough to wear around they city all day. 5. Leather Saddlebag // Well made, neutral, and very versatile: this saddlebag is a smart accessory that's sure to please. 6. Rose Hibiscus Face Mist // Although it is excellent for daily use, I love this face mist for when I travel. Airplanes can significantly dry out your skin and expose you to bacteria and germs. This mist is moisturizing and naturally tones and lightly cleanses. On sun filled trips it serves dual purpose-soothing sunburned skin with aloe-vera and coconut water. 7. 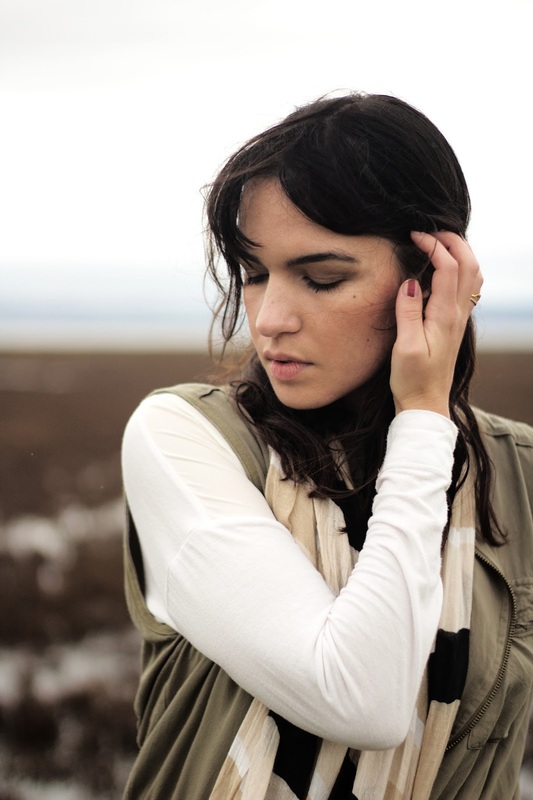 Silk Bandana // Happily, the scarf trend has yet to recede. This silk bandana is chic and simple, easy to style into most wardrobes. 8. Blush Sunglasses // Retro inspired and unapologetically girly, these sunglasses are a great addition to her collection. 9. Rose Swing Coat // I love the minimal, clean lines of this coat and how the blush rose color is soft enough you can wear it as a neutral. It's a great coat to wear through winter into spring. What are you hoping for this Valentine's Day? Which gift guide would you like most? While I advertise "For Him" or "For Her" I don't believe these gifts are limited to genders. Would you like any gifts for him? (My top two favorite gifts here might actually be on the men's gift guide: #1, the French Press Set and #3, the Domino Set! ).